In Cameroon, the first lady's wardrobe has made her so popular she routinely launches trends and has a hairstyle, the Chantal Biya, named after her. Oh you gotta give it to her: Michelle Obama tried. 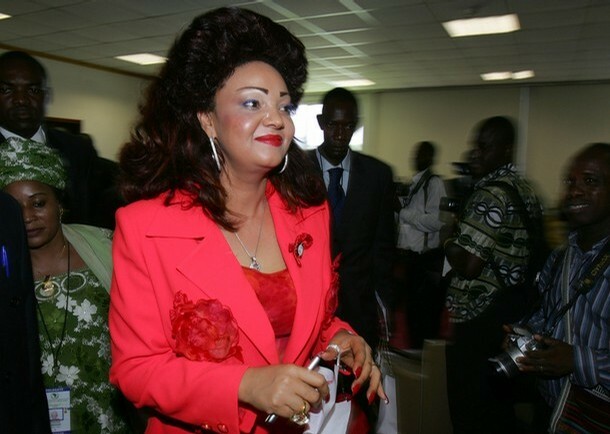 But even in her chic cowl neck number she still could not over shadow the lady in red (and leading fashionista) in the photo above: Chantal Biya, 39, first lady of Cameroon. Out of the dozens of "couple" photos to emerge last week, Biya's is the only one that caught my attention. And yet, this red number (with matching red hair) is but a toned down version of Biya's legendary glitz and glam. 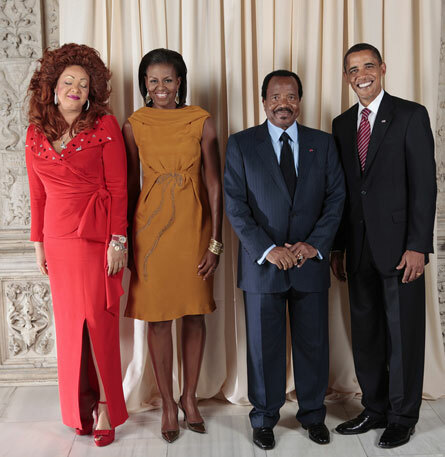 A quick scan of photos snapped of Cameroon's first lady reveal a woman who has cultivated a particular brand of fabulosity which can only be described as: bold, brazen and - yes, beautiful. As you can see from these photos, Biya loves a combination of traditional and western gear. In the past, she's mentioned Dior and Chanel as her favorite European labels, while the traditional African outfits she dons are custom made, designed and sewn by tailors. No matter the origin of her ensembles though, it's almost guaranteed to inspire the same reaction: an open-mouthed, wide-eyed stare. Whether posing with Paris or kneeling in front of the Pope or greeting the paps, she always steals the scene. What makes her unique in her chic is that all elements of her ensemble - from hair to to makeup to garments - seem to battle each other for attention. It's never clear which wins. As I type this, my mother, a proud and stylish African woman herself, is almost embarrassed at my level of enthusiasm. 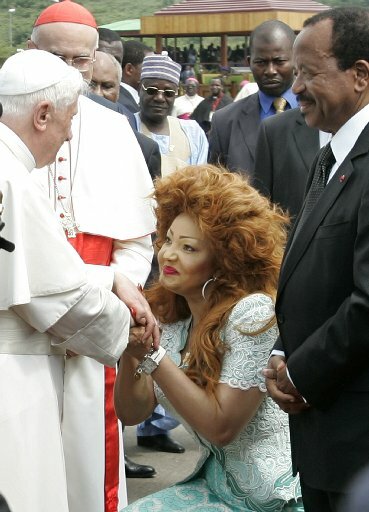 In her opinion, Biya generally looks tacky, a point I won't argue. Yet, while she may be no where near as polished in her presentation as M.Obama, she is every bit as passionate about fashion. In Cameroon, her wardrobe has made her so popular she routinely launches trends and has a hairstyle, the Chantal Biya, named after her. Exotic ensembles, trend setting hair styles, and a dedicated following: if these do not a fashion icon make, then I don't know what does. Read more from Zandile on her daily fashion blog, The Blay Report.